EAST BOSTON -- A man who ignored a fire hydrant put Boston firefighters at risk Wednesday night. The man who parked his new BMW in front of a fire hydrant slowed the battle to save East Boston homes. 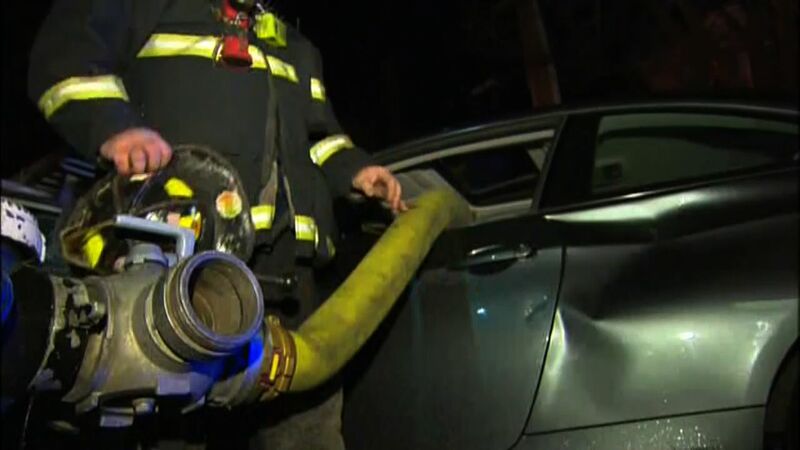 As CBS Boston reports, firefighters were forced to smash the windows and thread the fire hose through the car. The fire on Lexington Street grew to eight alarms before crews were able to get control. No one was hurt, but nearly three dozen people have to find a new place to live. The man had just bought the BMW and the registration was just two days old. He also got a $100 fine. "He was mad," said Rafael Henriquez, who is friends with the car's owner. He watched as firefighters busted through the windows to hook their hose onto the hydrant. "I wanted to cry for him," Henriquez said. "Of course he brought that on himself." In fact, Boston firefighters say the only thing on their minds was getting water as quickly as possible to the burning homes which were at that point fully engulfed. Since it had gone to eight alarms, all the closer hydrants were taken. The one blocked by the BMW was a street away. "You don't want to lose the full force of the water you're getting from the hydrant," Steve MacDonald of Boston Fire said. "It's important to be as straight as possible." The hose still had a kink even after they got it hooked up, so bystanders pitched in and helped firefighters lift and bounce the car away from the curb. "You can move the car a short distance which is what they did to get the kink out," MacDonald said. "Again this is all effort that should be concentrated on putting the fire out." Back at the scene, firefighters traced the source of the flames to the engine of a Toyota parked in an alley, spreading fire to three nearby buildings, leaving residents like Jaime Hernandez homeless. "We're trying to figure out where we're going to stay and for now my friend offered me shelter at her house," Hernandez said. Residents say the owner of the BMW drove it away with two broken windows and a big dent on the side.